Not agreeing with every ones opinion, but having enough wisdom, to know, you don’t need to debate it, or argue about it, or try to make someone understand. To respect the differences. Or even hit them on the head with the truth. Sometimes, you have to go through a few things to get it. I think I got it…. Thank you Jesus. You see, love, should always be evident. Without trying to make someone feel bad, or to reject them. We are all on the vine at different places. I may try to show you truth. But I pray to do it with love, and yes respect. Because you are a child of God, as I am. This is one more new motto…..I will carry as a badge of honor, I pray, to His glory. BUT THANKS BE TO GOD, WHICH GIVETH US THE VICTORY THROUGH OUR LORD JESUS CHRIST. I CORINTHIANS 15:57. KJV. So, its almost the end of the year of 2015. And I am thinking, I need to make resolutions. For 2016. As a Christian. But personally as well. Things I know, but things, I need to implement, even in writing. To decree it, to remind myself, to justify it by words. Not my words, but every pure and holy word of God, from my King James Bible. That is not corrupted. And when I see other brothers and sisters in Christ, using corrupted word, my heart aches for them. As I know God does ache for them too, but I can only pray to make a difference, in someones faith, in their ability to know God, and to be fulfilled, in the calling for their life. That people would see the many warnings, in scripture that warn us about this deception. Including, Revelation 22:18-19. And I know this is my calling, so even here, as I write my resolutions, I pray you see the deception of using corrupted Bibles. This scripture came to me just yesterday, and it just tells it like it is, how so many are deceived, by someones greed, that changes a Holy Bible. It is sad, but this scripture hits it on point. They have made merchanise of Gods word, by changing it with the excuse that versions bring insight. But in doing so they have disobeyed God. They have corrupted a holy word. AND THROUGH COVETOUSNESS SHALL THEY WITH FEIGNED WORDS MAKE MERCHANDISE OF YOU: WHOSE JUDGMENT NOW OF A LONG TIME LINGERETH NOT, AND THEIR DAMNATION SLUMBERETH NOT. II Peter 2:3. Friend, you don’t want to reap that same damnation. So I implore you go back and use a King James Bible. Not a NKJV either, don’t confuse that. That is corrupted as well. As well as all of those versions. This is my goal front and center, in Christ. As this year ends. And the new year starts….But in my journey, of life, I pray God gives me countless opportunities. To show you all the deception of these “revised” bibles. So I ask God for long life, in all of my resolutions. So here, now are just my thoughts, my resolutions, and I pray it blesses. For my walk with God, for my life. In this journey we call life. My first resolution, and determination for the new year is to give God glory. To praise Him, to acknowledge Him, to always bring God into every conversation, if possible. To shine His truth. In all that I am. To speak it, to write it, to be someone who represents the King of Kings. As an ambassador of Christ. I want to do this with His holiness, His ability, His power, His might. His miracles magnified. I cannot do it on my own, but by who He is. I want to please God. For I know, my life, my blessings are so determined on that. Faith pleases God. So I will daily work on my faith. I want to walk in the authority of Gods word, my King James bible, that is not corrupted, and is holy and know that I can rebuke something that is not of God, from my life. I want you to walk in that holiness as well. So I will keep hammering it, till God says stop. I want to have the mind of Christ. To think, say and do that which is right in His sight. I want to get back what the devil has stolen from me. I pray I can see the fulfillment. Just so I can say, “Look what the Lord has done for me.” It gets me righteously angry, that I was so naive. So ignorant to Gods truth, that I see the many mistakes I made. Yes, I judge myself. We are called to do that, and though, I want to extend grace even to myself, I cannot help and see, I can be my own worst enemy, by not obeying God. So yes, I want to be mindful with the mind of Christ, to obey God, and listen ever so carefully to the promptings of the H0ly Spirit. I need to always remember to discipline myself through Gods Holy word, by reading it. Chewing on it. Meditating on it, writing it, and living it. As I claim it. Sharpening my spirit. Sharpening my senses so I am not dull and dumb. I see how the enemy deceives when any of us do not know truth Gods, truth. I want to be mindful to walk in love. To be love, as Christ is love. To always be a reflection of Christ. To all. To be polite. To not seek my own gratification but that of others first, in the sense that I cannot be selfish. Self, is a symptom that the enemy can sneak in there to steal and deceive. So I want to be aware of the enemies antics. Yes knowing that the enemy, comes to kill steal and destroy, has taught me more then ever to submit to God. OBEY GOD! Resist the enemy and he will flee. So I will rebuke the enemy. I will rebuke those negative thoughts of doom and gloom. And send them right back to the pit of hell. I send curses back to the sender. I am called to bless, but if someone wants to curse, they bounce right off of me, because I wear the armor of God. Which reminds me, I need to put on that armor daily. And it quenches the fiery darts of the enemy. They reap what they sow. As I do. Knowing this is a principle, that is like a boomerang. I will be prayerful. I know there is power in prayer. So I resolve to pray for myself, and others. To not forget the power of just even a small whisper to say, God help me. Help that person. I want to be kind to all. To have the compassion of Christ. To extend mercy. So they will see Christ in me. I want to be firm in my resolve in what is truth and what is not. I cannot compromise any more, my values. For anyone. This goes back to pleasing God. If people do not like that about me, that is their problem, not mine. I want to be a truth seeker for all things. Something about truth it frees a person, and so I see the need to seek it and bring truth to the light for myself. To grow, to change, to not be ashamed. I want to walk in the authority of who I am in Christ. Totally. As the Kings daughter. I need to see, I am Royalty. I am the head. Not the tail. I am to be respected, honored and cherished. So I do that for myself morally, and with integrity. My past does not indicate my future, for I have repented. I don’t need to follow the crowd. I follow Jesus. And that keeps me on the straight and narrow path. So, I remind myself, that repentance is always the key to getting back right with God. For I make mistakes. But purposeful disobedience, is so very wrong, and repentance does not accomplish anything if I do not learn from my mistakes. If I purposely disobey. So, I will not treat the sacrifice of my Lord and savior Christ shabbily. I will work out my salvation, with fear and trembling in the fear of God. Being fearful of God, is one of the most healthiest things I can do, and it keeps me out of trouble. And I then can avoid the consequences. If only, by example, by even writing this, I pray the body of Christ would get this, and understand it, for it is not taught. I need to eat better, physically because my physical health is so vital in this. But I also need to eat spiritually nothing but that which is of God. I don’t need to eat junk food spiritually or physically. And when I say junk food spiritually, I have to be mindful of subliminal messages that come in the form of junk, or evil. I don’t need to eat anything that offends God. I don’t need to know anything evil. I am reminded of Adam and Eve, and that they ate from the tree of good and evil. THAT WAS SIN! God did not want them to know evil. So I know this is sin. Just because one knows how to do something, does not mean they should. Reject it. I do not want sin in my life, in any shape or form, so I will be careful to discipline myself in that which I eat physically and spiritually. I realize what a gift health is, so I pray to know that which is healthy. I am reminded to test and try the spirits. I have seen in this past year, many who claim they come in the name of the Lord, but their fruit is rotten. There are deceptive spirits. Who do not obey God, even in the word they choose. They compromise. And it is so evident it is sin. They actually reject Gods law, and take scripture and try to manipulate, and justify their sin, by grace. And that is just wrong. It is an abuse of Gods mercy, and I will be ever so careful not to trust people. But to trust God. My King James bible. For it says, thus saith the Lord! I am reminded that my spiritual growth is my responsibility. So I cannot get a lazy attitude, to put off anything. For the truth of matter, is tomorrow is not promised to anyone. I have to see how valuable my time is. I have to see how important that in this time I have not to put off anyone or myself, and more then anything God. Being rushed is not an excuse to put off God. So I must discipline myself first to always go back to step one. To give God glory. I know more then ever, how important Salvation is, how important it is to make things right with God. To be humble, to be aware, how pride steals, and is a characteristic of the enemy. So I must always relinquish pride, in being humble. To forgive. To forgive others and myself. To let go of offences. To have my peace. There are times, I cannot engage in battles. So I remember the battle is the Lords. I have always been of the mindset to fight. I am a warrior at heart. But there are some things I see, even now in this time of my life. I cannot fight. But God can, so I see my Lord, more then ever, defending me. Taking care of me, protecting me. Providing for me. So I am thankful. I resolve more then ever, to be grateful. To always count my blessings. To see they out number my lack. Which I know God can fill up my cup. But I know more then ever, I do not seek God for what He can give me, but for who He is. I know that…So I pray to be a giver, in great and big ways. But to give, is just such a sweet release of being grateful. I plead the blood of Jesus, when all else comes to that point of understanding. It is all about what Christ did on that Cross for me. The blood of Jesus, is the final authority in who I am so I resolve to plead it for I know, my own ability, my own gifts and callings yes work together for the sake of the Kingdom of God. But it is the blood of Jesus I plead, that makes me who I am in Christ. I am a miracle. That supernatural sense of miracles. Because of the sacrifice of Christ. And I pray, my love, my obedience, my longing to please Him, which goes back to the first steps with bless my King. For now, I conclude my resolutions. But leave room, even here to come back to decree it. In the name of Jesus, this is my decree, my resolution, with wisdom, for the new year. Of 2016. May it be to the glory of God in my life. For myself, and my family, to be blessed, and others. Just thought, I would share, and announce another new blog, I have here on WordPress. I want to ask questions, that make you think, inspire you to know what God thinks, so you can ask Him. I want it to be a place of prayer. I want it to be a place of order though, not where some random question is hurled at you. If I share a question for you to ask God, I want it to be a place, where you can get the answer. By Gods holy King James word. But I want to inspire you to ask God. To seek our Lord, the King of Kings, and Lord of Lords. For His glory. I have already established some questions there. Check out the posts. Please check it out, and sign up for the blog there. Click the link it will take you there…. For the sake of keeping your privacy, and your church’s privacy, I will not say your name, or the name of your church. I state here, that your my pastor, in this title. But I do not know you. We have never chatted. I just haven’t been released from your church. God has not released me. Though this may do it. Sadly… Though, we have not sat in your congregation, for a time. But I have appreciated, who you are in Christ. I have appreciated your teachings, but I do not appreciate, that you do not use the King James Bible only. I write to you, because I can only say I feel led by God. It is not to argue, it is not to be disrespectful, it is to bring truth. Truth, that I once tried to share with you a few months ago. But, you dismissed me, and my notion, in front of the congregation, and did not take it to heart. I will say here for the record, I did not get offended. Not even embarrassed. I was just going to let it go…But do you ever know something, that you just know, you know….and you can’t let it go? You can’t just say, oh well…and leave it alone. You have to try to convince someone. Perhaps because you see the danger, you see the affect, it has on someone. Like smoking. Its bad for ones health….It is a slow poison. After a while, it will not be received. Because it will be too late. Well that’s what I am going to try and do in this letter. I am praying to convince you. I truly believe, that anybody who uses any other Bible version, than the King James Bible, is in disobedience. And they might not even know it, because gee whiz, after all isn’t it Gods word? But is it? Its not, when men have touched it, and changed it. And by what the Lord shared with me, those who continue in it, will receive a “spirit of confusion.” Boy, I can just sense people getting angry as they read this. Maybe even you. But I have to express it. For, this is what I feel and know, as truth. Its not to judge you, or anybody, in fact, when I present this. 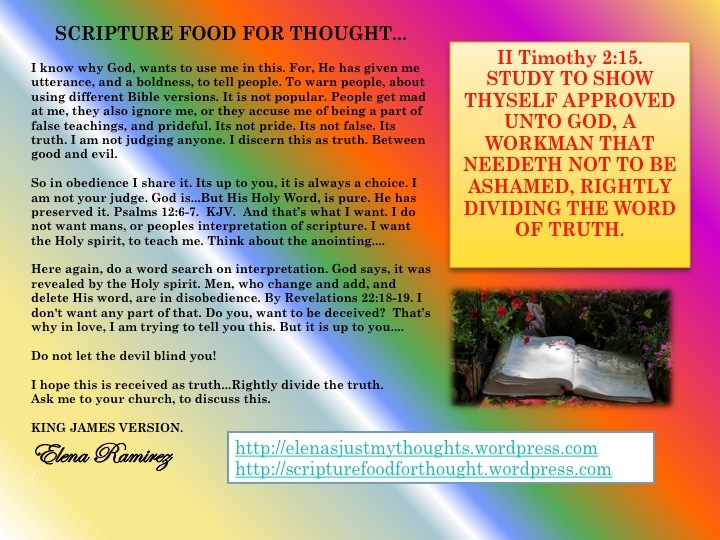 My blog is called “Just My Thoughts” but, I base it on the word of God. The King James Bible. Everyone tells me, as you did. The Bible has been transposed, translated, since the beginning of time. But what average Christian, has the opportunity, to walk into any store, and get a Hebrew Bible? They are not available. The closest thing, we have to being pure, is the King James Bible. It does not have any copyrights. It is preserved, and tried. Psalms 12:6-7. Read the King James version of this scripture. That has preserved it. Because man, has no copyright to it. It cannot be changed. All, other versions, of the Bible, from other publishers etc. Have copyrights. Why? Because, they want to control the content. They want to control it for the sake of money. Here is a thought, but what if, in the very near future…. All Bibles were banned for sale? What if the King James Bible was eliminated? But, what if there was an outcry, and people wanted to be united, in a world religion? What if governments, controlled the Bible, and all that was available, was what they wanted to present? They would implement, a Bible that was user-friendly. For all people to use…What if? I pray, it would never happen. But what if? There is such a persecution against Christians right now. It could happen….God I pray, it would not. But people, are so easily swayed….God says it will happen….KJV. Amos 8:11…Behold the days come, saith the Lord God, that I will send a famine in the land, not a famine of bread, nor a thirst for water, but of hearing the words of the Lord. I think that famine is now. The world, embraces, other Bible versions. They do not teach them according to the old “path.” Hmmmm….. So what can anyone do right now? Stand up for the truth. I know, I am just scratching the surface. But I know this is truth. And I am shouting it out, from my soap box, my blogs, because this is the only forum I have now. But you don’t, you have, authority. You have credentials. You have the forum…..You are a Pastor. A man of God. People want to use other Bible versions, because they think it will make it easier to comprehend. A lie from the devil. People say; “I compare, the different versions. to know the difference. To get more understanding.” Sure make the comparison, see the discrepancies, but then stop it! Don’t keep using the other versions. Over and over again. And thats where the devil snags people. Confusing them. Your supposed to take God at His word! His pure word! Remember Adam and Eve? They should have taken God at His word! Sin. Doubting, disbelieving, comparing…that is DISOBEDIENCE! The Bible tells us, about interpretation…. II Peter 1:20. Knowing this first, that no prophecy of the scripture is of any private interpretation. For the prophecy came not in old time by the will of man, but Holy men of God spake as they were moved by the Holy Spirit. It is the Holy spirit, that brought the word of God, in the form, that it is, by the KJV. For over 400 years, it has been established, preserved. I will say it here, and again, I do not want man’s, or any bodies interruptation, or any organization, to teach me the word of God. That has been corrupted, by mans hands. I want the pure word of God, that has been tried. That is disobedience. Revelations 22:18-19 KJV, tells us not to add or delete from His word. It is very clear. So, why do people not take this to heart? Because they do not know. Leaders, Pastors, should not be watering down the gospel. For any reason. It is a disservice, when any Pastor does that. Especially, because if you do comparisons, or try to relate it, to the original text from the words. The meanings, are totally different. Different wording in the definitions. Not to mention, the countless scriptures, that have been eliminated. I have done extensive studies on the word of God. From the KJV, as my main lump, and when I note the differences, to other versions, I am shocked, with what I see. The word definition’s, are always a miss. When I prayed about this, recently, the Lord did tell me people get “a spirit of confusion,” when they read other Bible versions. I know my Lord, is not the author of confusion. His word, is alive. There is no other book, where the author is present, when one reads it. And He stands by His word. There are countless scriptures, that confirm to this truth. All of Psalms 119, talk about the word. Even here, in the NIV,they try to leave out, that HE is the author. I Corinthians 14:33. Read it and compare it yourself. Talk about Plagiarism. Now even more, I understand, Gods perspective. Because He has understood my perspective, when people have taken my writings, and claimed they were the author. When that happened, God calmed me down. Saying vengeance is mine. But He told me, He was jealous for His word as well. It’s like the devil, trying to say, He is the author. Because He deceives…. And, because the KJV says, God is not the AUTHOR of confusion. I looked up the two versions, and the NIV, and it said, he was not the God of “disorder.” Those are two different word meanings, and definitions. Very different, and distinct differences between those words. Confusion – to make mentally unclear. Uncertain. Disorder – To disturb the regular or normal functions. How can anyone not see, by changing the words, they have caused confusion, and disorder. To Gods Holy Word. They have done both sadly…. How can anyone comprehend, the truth from God, if Bibles like this distort the word? Let alone the anointing being missing. There is no power…. What about faith? How can anyone build faith, if the words, are so much in disarray? The devil, understands the power of words. Incantations. He understands, how words should be precise. He wants people to keep reading other Bible versions. There is no power in Bible verses, that have been corrupted, by mans carnal hands. I plead the blood of Jesus! Over everyone who reads this to understand! Gods truth! His beautiful, pure, and Holy word….The uncorruptible word. The doctrine! II Corinthians 10:4 For the weapons of our warfare are not carnal, but mighty through God to the pulling down of strong holds. To have a real weapon, a sword, to fight that ugly devil! When I talk to people, and I quote scripture sometimes, that just comes from my heart, I test people, and they do not know the word. Why? Because it cannot relate to the heart, as God would want it. It’s man’s words. That corrupt it. I have likened it to a recipe. Gods prize winning recipe. You do not mess with any ingredient, or it will not taste the same. It is spiritual food. I have likened it, to using a rubber sword. It cannot cut, to the truth, like the KJV. Gods word, is a two-edged sword. It cuts, when it goes in, and brings light to the sin, and it cuts with healing, when it comes out. Rubber swords, cannot do that. Now, I liken it, to mold, on living bread. Christ told us, that He was THAT living bread. John 6;48 I AM THAT BREAD OF LIFE. In the NIV same scripture it says….I am the bread of life. What a difference when that word ‘THAT” is pronounced. It separates lies from truth. Jesus is THAT bread of life. We are warned, that we cannot eat at the table of the Lord, and at the devils table. Read it from the KJV. I Corinthians 10:21. You don’t think that makes a difference? Well, in one of your church services, you used this scripture reference. You gave I John 4:19. From the NIV. We love because he first loved us. But the KJV says, We love HIM because He first loved us. That one word, makes such a difference in scripture. Because it relates, to us loving HIM. That’s what it is all about first and foremost. Not just loving. How can any of us love without HIM? Anyway? How meaningful, it is when we see, HIM, in the equation. Here is one more example…That I am bringing to make a comparison. In Jeremiah 6:16, KJV a warning….Stand ye in the ways, and see, and ask, for the old paths. Where is the good way, and walk therein, and ye shall find rest for your souls. But they said, we will not walk therein. In the KJV, there is no mention of crossroads. Crossroads in my determination means, I have four choices. East, West, North, and South. It confuses again. Where is the good way? Where is the direction to “see. ?” You know, as a man of God, you know, the devil blinds people. Read John 12:40. The King James version. God does not make it that difficult. Why do Pastors, even famous pastors, publishers, and just your average, Christian, cannot see this lie from hell…. Is beyond me. Because I see so many using different versions. Why? The stores are filled with more different versions. When God speaks from heaven. He does not stutter. I have heard people say, that the words is archaic. My goodness, let God teach you…..He would if you asked. But no, they have deleted that and so many other things from other Bible versions. I could go on, but there are so many discrepancies. When I first received the Lord, and my salvation, at the age of 12 years old. I won a Bible. I still have it. I won it. For learning scriptures, and for winning other kids to Christ. By taking them to the Vacation Bible school, that I went to. I got it in 1965. For being the top honor student…in sixth grade. The scripture reference, in my Little white Bible of purity, for dedication they gave me, was II Timothy 2:15. Which by the way, was a KJV Bible. Study to shew thyself approved unto God, a workman that needeth not to be ashamed, rightly dividing the word of truth. But shun profane and vain babblings; for they will increase unto more ungodliness. Whenever, I have needed help, I went to that little Bible. And as I touched it here, I felt Gods power, and I cried. When we got married, we began reading the NIV. But when I learned this truth, I was changed. When we stopped reading the NIV. That was about two years ago. My husband as well. My family….That night, that I had discovered this, I actually dreamt, I was showered in light! Do you know, I cannot sit, in a church anymore, when they use different Bible versions. Its an unction from the Holy Spirit, and I cringe. Because I sense the lying spirit, of the devil. I sense the spirit of confusion. I go to different churches, or I listen to Pastors, and they all use some version or another. And I grieve. I asked God, to feel what He felt, and this is what He has shown me. And I have always pondered on that word. Of II Timothy 2:15. All of my life. In its dedication. And I know now, more then ever, the difference. I am dividing the truth, from the lies. Now more then ever, I realize, God has given me an utterance, and a boldness, to bring it up. I am meant for this calling, more then I could even see. Even though, I know, I am scratching the surface, I know it is truth. I know my life, is meant to defend, and to speak truth, about His word. Whether it is received or not. I have been ashamed in my lifetime. I have made mistakes. I have sinned, I have come short of the glory of God. But His word. His truth, His true word, has been a light unto my path. 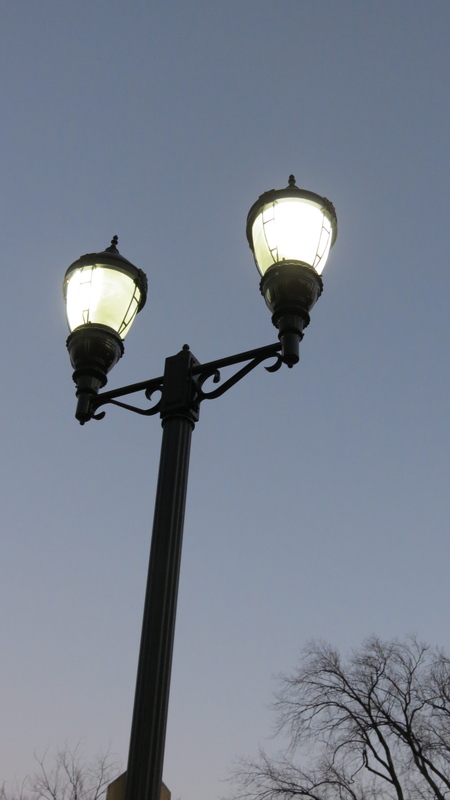 A lamp unto my feet…..
No one takes me serious. They either think, I am nuts, or I am some ignorant, Hispanic woman. And believe me that is a stereotype. But people think it….But I know Gods word….I still need to learn more. But I know enough, to know what is truth. And what is God’s heart in this….He wants us to know truth. His truth. It angers God. It grieves Him. But He is waiting it out. To prove it…. Well I believe I am here to confound the wise. All those who dismissmed me. This is going to change. I have Gods favor, more then ever. Because this is His Word. I Corinthians 1:27. For Gods word, says, I am the head, and not the tail. Deuteronomy 28:13. KJV. And the Lord shall make thee the head, and not the tail, and thou shalt be above only, and thou shalt not be beneath, if that thou hearken unto the commandments of the Lord thy God, which I command thee this day, to observe and to do them. We are all going to stand before Him. He will judge us all. The book of life will be opened. And what will He say? Scary thought. The fear of Him, does make me want to do this right. And as I conclude, I hope you take this to heart…Because again, I know Pastors, want to make it easier, for people to understand the word of God. But God wants to teach them. All we are to do, is present, His pure word, to the people. We have to grow up. Yes, maybe people did read the other Bible versions, because they needed help. They needed the milk. Well, I won’t be a part of that disobedience. Because it is. And I do not want to be deceived, as the word of God says, also. God has preserved His word, but man has not. I will not compromise Gods truth. Not for my spiritual learning. I put away my coloring books. I put away, my books, that partially illustrate the truth. I put away bible versions, that do not come from Gods throne. But from deceptiveness straight out of hell. I Corinthians 13:11. KJV. When I was a child, I spake as a child, I understood as a child; but when I became a man, I put away childish things. Yes, we do have to mature. We have to grow on the vine with Christ. Yes, we all are growing at different levels. But Love, His love, what His sacrifice did, and still does tend to do, has changed me. Because God so loved the world, that He gave us His son, that if we believe, we would have everlasting life. Love, came from the cross and prompts me to write this. I LOVE HIM, Because He first loved me…..And because I love Him, I am commanded to love others. Because I will stand before Him, and if I do not, share truth. I will be accountable. And I am in fear of God. For my life, for my soul. He is the only one who has that power. Even here I claim his protection, by knowing His word. I want the meat of Gods word. So, I can be transformed, so the anointing can come forth. So the power of God almighty, can heal people. So it can heal me. Which it has, done spiritually and physically. So it can bring His glory into a church service. So the Holy Spirit, can touch lives. So I can stand before God, and say, I tried Father. I tried, to bring them the truth. Not mans, but your truth. Lord….have mercy! No I will not judge people. I will tell them the truth. They have been mean to me, called me names. Accusing me of this and that, taken me out of places of authority. Saying it was a method. As I led others to Christ, in a Christian organization. Trying to disgrace my name. Trying to discredit me, in any way they could. For years, the devil has tried to stop me. By even using other brothers and sisters to lie about me. But I forgave them. Because, I know the devil is the accuser. Revelation 12:10. And I know Christ came to give me life abundantly. And them as well. God is not a respecter of persons. I know the wheat and the tares are mixed together. And we will be separated….But the oil is in my lamp, and it is ready to go, for Christ. I will not be caught with no oil in my lamp. I will share the truth now. To whoever will listen to me. I will keep my lamp lit, only by my Lords pure word. And nothing else. My zeal hath consumed me, because mine enemies have forgotten thy words. Thy word is very pure; therefore thy servant loveth it. Psalm 119:139-140. So here is my letter to you. I write to you, because I am prompted by my Lord to tell you this. And because, I see the potential, the gift God has placed in you. You are a gifted speaker, probably one of the best, I have ever heard. But I cannot listen to you, because you, compromise the word. It grieves me. Because I have no church to go to now….But I trust God. Maybe this will persuade you. Maybe not. Maybe it will prompt you to talk to me. Maybe not. Maybe, we will go back. Maybe not. Maybe…..Instead of thus saith the Lord. It is written…. See how that sounds? I wrote it that way, to see, the comparison. Like a double minded person, going back and forth. it could even be perceived, as confusing, to some. Back and forth. Well I know, God does not want that for any of us. But, thats what happens to someone, who gets part word, part truth. I thank God, I know His voice, and to another I will not follow. So, I really do not know where God will take this. But God knows. He knows now, what you will do. And what will happen. All I know, by Gods word, I have the mind of Christ, He will guide me. He will guide you too, if you take Him, at His word. I have to be obedient to my Lord. It takes discipline, it takes His pure word. It is time for thee, Lord, to work: for they have made void thy law. Psalms 119:126. Thanks for reading my letter to you. And to ever who has ears, let him hear…. Mark 4:9. And He said unto them, He that hath ears to hear, let him hear. KJV. 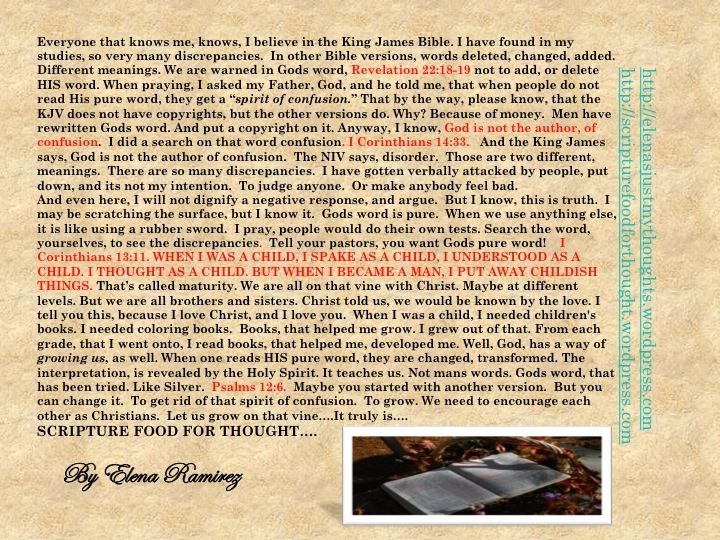 Just my thoughts, in Christ, and His love…..
p.s. To all my critics, to those who do not believe this. Do your own tests. God is faithful to His word. There is power in His word. Study the King James, and see it speak to you. Don’t just take my word for it. Take the word of God literally, apply it, pray it to your need, etc. Make your own comparisons. God wants you to do this….I love Gods pure word. It makes such a difference. Blessings, and love in Christ…. My latest blog on the discrepancies of the Bible. Lord, I am weary, trying to sort this out, but I will fight, a good fight of faith. I will not be weary, in well doing. The battle is yours. You are my protecter. I plead the blood of Jesus, and bind the devil. I will not dignify a negative reaction from anyone. I put it in your hands. To use, in truth. For your glory. Let it speak, volumes. Your volumes. Your Holy word Lord. Thank you for letting me be a part of this truth. In Jesus name. Amen. Have you ever had someone offend you, and you forgave them, but they brought it up again? Stirring up the hurt feelings, and the pain, and you had to re-forgive them? Or maybe you did not forgive them? I know I did…. Well, recently something like that happened to me. And you know, I love this person dearly, but it started to nag me. And I thought, why would that person bring up the subject again, especially if they forgave me too? The word of God says, we need to quit talking about it. Sure vent, get it out of the way, hug, forgive, but don’t remind someone, unless you want to argue again. And, well, all I know, is that the devil, wants us to be offended. He wants us to walk OUT of love with others. No offense, is worth losing my blessings. Getting out of my love walk with others. Sometimes it is maturity, and we just have to grow. But I have decided here and now, I won’t say anything to hurt that person, about it. I forgave. I want to be forgiven. And I refuse to give place to the devil. I so want Gods love, and compassion, and understanding. But I have to grow. I have to let go of offenses. Throw them in the “Sea Of Forgetting” and live. Christ has done that with my sins, when I repented, and HE threw them away. I need to do that too. I love my friend. I hope my friend does too. For, I love Gods love, I know it is his grace though, to forgive…. GREAT PEACE HAVE THEY WHICH LOVE THY LAW, AND NOTHING SHALL OFFEND THEM PSALM 119:165. So, I hold onto this scripture, with all my might, so I will not be offended. So, I will not lose my blessings. So I will not give place to the devil. I submit to God, and yes his Law. For it is grace….It brings Peace. 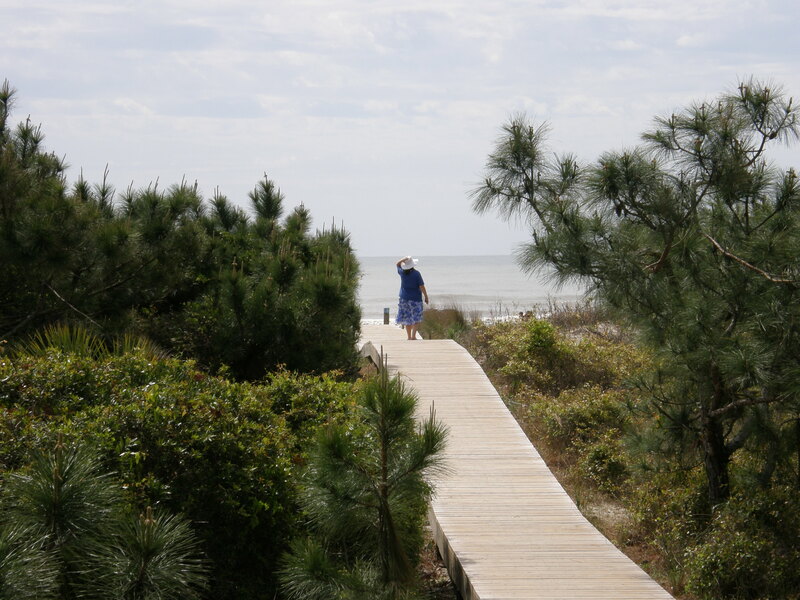 The Best of God (A Testimony) This is a testimony of how God answered my prayer in Florida, by a sweet and beautiful way. I hope it blesses you. Elena Ramirez Prayer of God Ministries. All prayer requests, comments, and feedback is appreciated. If you would like to subscribe, you may do so, at the blog. This will ensure that you will receive them and will help me manage, and keep your e-mail address, safe from spammers. Etc. I am seeking employment to write for your newsletter, blog or newspaper. If you would like more information, please contact me at prayerofgod@comcast.net. You may also find more of my links, and information at the top link, of this blog, that gives my mission statement. I pray Numbers 6:24-26 for you. Please check out my web page of Daily Bible Stories. Blessed by a ministry that provides this. I invite you, to check out this link if you need to go to the throne, and make it right with God. The prayer I have written is the basic sinners prayer….I encourage you to read it, and pray it. God loves you, and it is so important that we are right with God, because we never know, when he will take our lives….Be ready, and prepared. Pray this prayer…. Check out, the key word of: “Prayers of Hope.” Or search here, on my blog. Elena’s other blogs to check out….. Please Sign up for your subscription today on each one…. and be blessed….God loves you, so do I! !